Changing trains from the Ishinomaki Line to the Rikuu East Line at Kogota Station. Another diesel train ride. This is today's final leg. Going back to Tokyo on the Yamabiko Shinkansen Train. 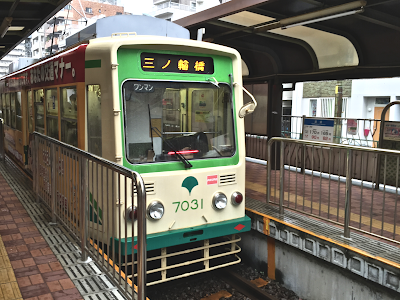 Taking the Ishinomaki Line for the first time. It's been years since I last rode a diesel train. I got the best seat in the car. No seat assignment is needed. Good bye Ishinomaki. I will be back soon. Really soon. Saying hello to 2 organizations who are building the future of Ishinomaki. First stop is ITNAV. They are nurturing the next generation of IT engineers in Ishinomaki. From left: Shimawaki-san a.k.a. Mitchey, high school student Kano-kun a.k.a. Oshika, and the leader of ITNAV Furuyama-san. "We change the IT of Ishinomaki here, you know." They are writing the code to make a positive shift in this city. Then I visited Chiba-san, the factory head of Ishinomaki Laboratory. They are a rapidly-growing community crafts studio whose catalogue is now popular even abroad. They can be the first global brand born in Ishinomaki. The wedding party closes with the speech by the bridal couple. Then on to the after party. The main attraction of the after party at IRORI. One of the leading chefs in Ishinomaki, Abe-san from Shochiku, grills fresh local oysters. The soul food of Ishinomaki, Kuzukake (arrowroot starch stew). This is also super delicious. DJ Moge in da IRORI. Ishinomaki night never ends. A time for photo session in a perfect light. Ishinomaki rapper Gakudan Hitori performs for the bride and groom and filled IRORI with his lyrics. With 2 brains of Ishinomaki 2.0. 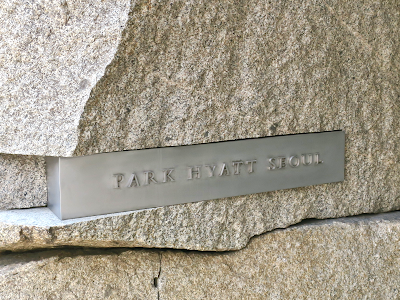 Associate Professor at Tokyo Institute of Technology Dr. Yosuke Mano and award-winning architect Mr. Osamu Nishida. 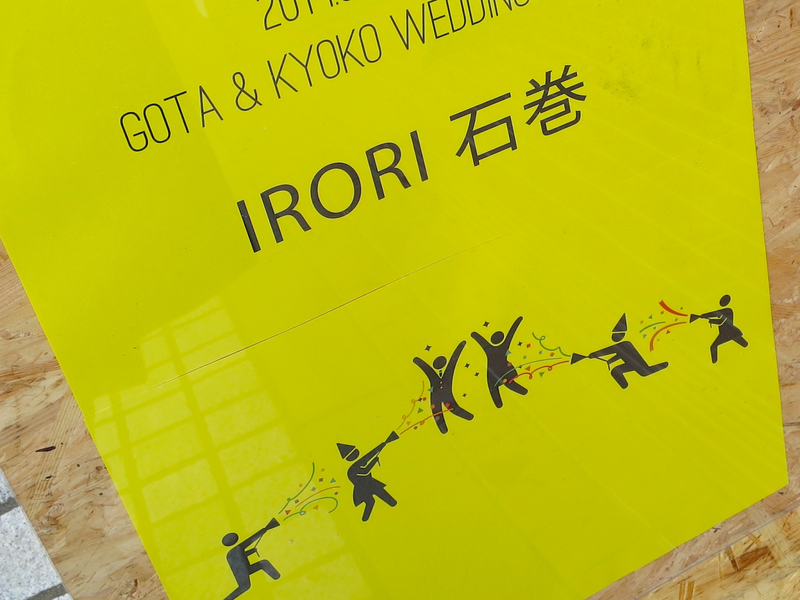 Abe-san, the chef-owner of Shochiku and one of founding members of Ishinomaki 2.0, prepared a wedding cake with the Ishinomaki 2.0 logo. The bridal couple with an alumna and alumni of Wieden+Kennedy Tokyo who are now deeply connected with Ishinomaki. Future Center Co Hack, a hub for several future-oriented community activities located on Aitopia Avenue, also turned into a party venue. The catering at Co Hack was prepared by Matsubaraso, the Japanese restaurant in Ishinomaki who used to be an inn. At this party beers should be KIRIN. KIRIN Beer is one of companies who has been supporting Ishinomaki 2.0 from the early days. Yet another venue. At Resilience Bar, Sato-san who is one of tutors of Ishinomaki School leads gospel choir flash mob in front of the bridal couple. One of four party venues is IRORI Ishinomaki, the home base of Ishinomaki 2.0. This is the most festive IRORI I've ever seen. Today Abe-san from New Roman-tei, the bar located inside Ishinomaki Grand Hotel, is supervising the beverage department at IRORI. 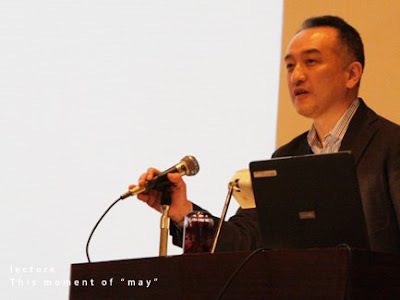 He is an evangelist and natural historian of Japanese sake. I know no better person to do this job in Ishinomaki. 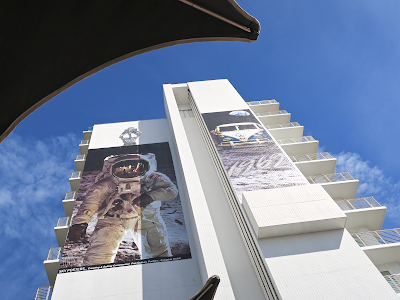 Each venue is connect with live Ustream broadcasting. So you can't miss the bride and groom even when they are at other venue. The wedding ceremony starts at Kameshichi Kimono Store. Please welcome the bride and groom. I was very honored to be appointed as the writer of their marriage vows. The bridal couple read it aloud in front of guests from all walks of life in and around Ishinomaki. A very happy day for these founding fathers of Ishinomaki 2.0, too. Abe-san a.k.a.Cheif and Akio. The sidewalks of Aitopia Avenue are almost a part of the wedding venue. 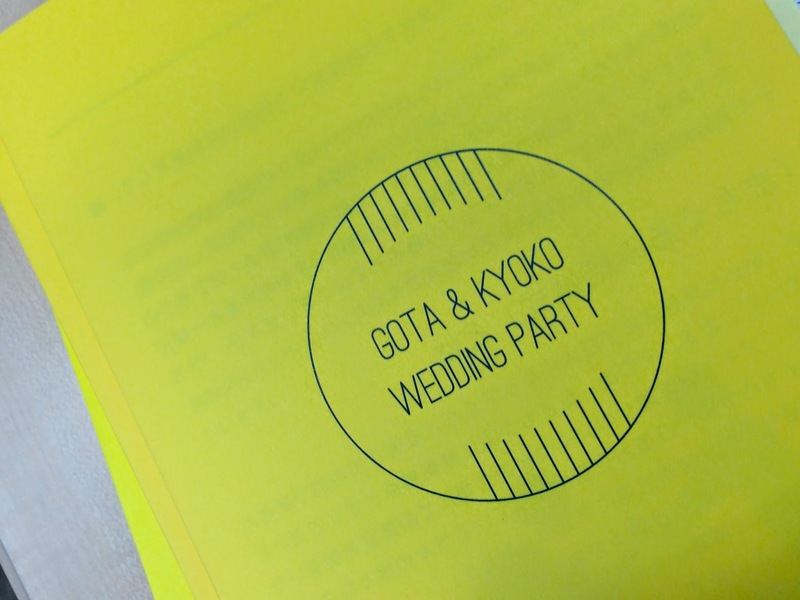 Tomorrow I'm attending the wedding party of Gota-san and Kyoko-san. Both of them are members of Ishinomaki 2.0, a community building organization of Ishinomaki which was founded right after the 311 tsunami in 2011. 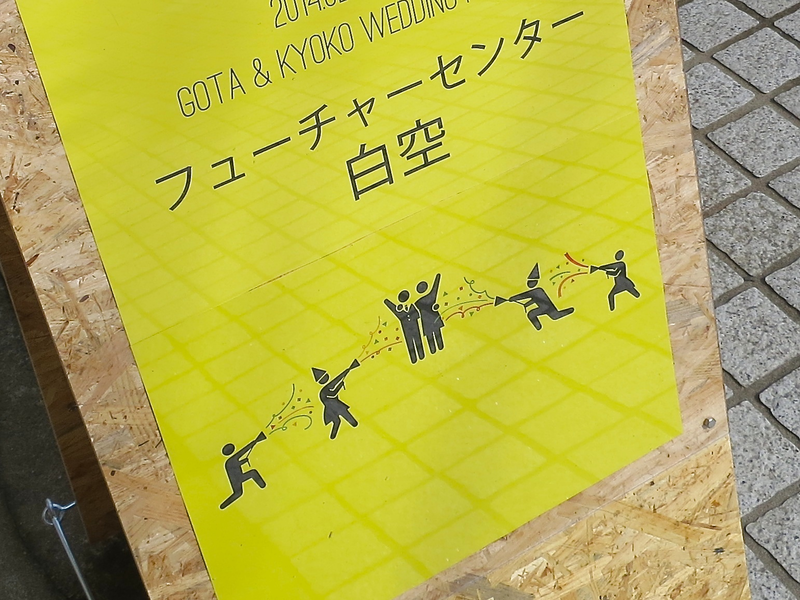 The party is named "Inviting-the-whole-town Wedding Party" and countless people in and around Ishinomaki will join. 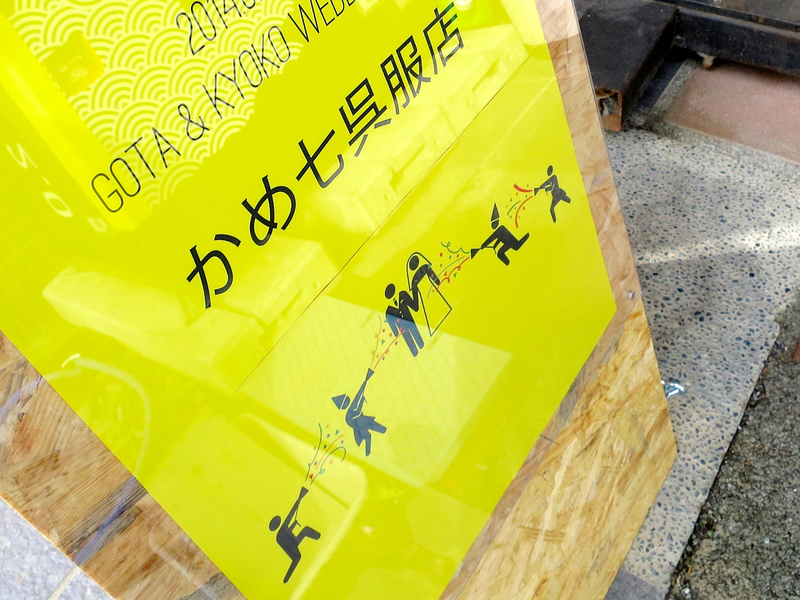 The party will be held at 4 key venues in the center of downtown Ishinomaki. And the bridal couple will make the rounds of these venues. Kameshichi Kimono Store, now also known as Community Cafe Kameshichi (Comi-Kame), is one of these venues and the main stage for the couple is ready inside the store.